Consider these feather storage tips if you own several duvets/comforters that you like to switch around with the change of seasons, or if you have several extra pillows for guests. Follow these basic tips to keep your bedding clean for the next time you need them. Do	not over-pack down for long periods of time. 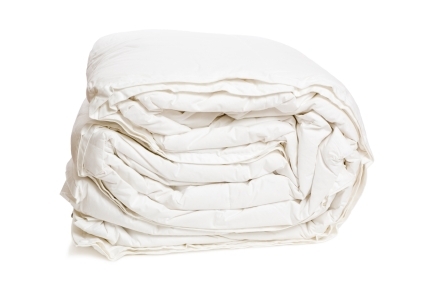 Fold your	duvet/comforter neatly but do not compress until all air is removed. Use	cotton storage bags, not plastic. Plastic doesn't breathe and will	not allow for air to circulate inside. If	you use a non breathable bag or container your bedding will have a moldy,	musty, smell when you take it out to use it. Put	a fabric softener dryer sheet in the storage bag for a nice scent. Do	not put heavy items on top of your stored down bedding. If	you're tight on shelving space purchase a storage bag that can hang	on a hook or clothes hanger in your closet to save space. Do	not place stored bedding near a heat source. Air	out on a clothes line or give a spin in the dryer on the cool air	setting after storage to restore loft and puffiness. Add	a fabric softener sheet or a clean cloth with a few dabs of your	favorite essential oil for a pleasant smell. If you can't find a big enough breathable bag use an inexpensive duvet/comforter cover or encasement. If you have several duvet covers use one of them. For added protection against dust mites, moths, and bed bugs get a storage bag with a membrane fabric and zipper closure. These heavy duty bags will insure your down bedding is clean and healthy come winter. Return from this Feather Storage tips page to the Down Bedding Delights home page.